After a long wait and lots of teasing, Samsung and three major US carriers (sans Verizon) unveiled the new Galaxy S II super phones as designed for American shores. All three phones will be available by fall, with Sprint&apos;s version coming first on September 16. Sprint&apos;s phone, called the Epic Touch 4G, will cost $199, which will hopefully set the standard for the device once it hits AT&T and T-Mobile later this year. Unlike Sprint, AT&T and T-Mobile opted not to give their phones flashy new names and are just calling them the Samsung Galaxy S II (guess the codenames Attain and Hercules didn&apos;t stick). The specs on the devices are predictably similar, and impressive (8 megapixel camera, 1.2 GHz dual core Exynos processor, Android 2.3 gingerbread, 4G-capable, 16gb of storage, Super AMOLED Plus screen, etc.) but there are a few noteworthy differences. 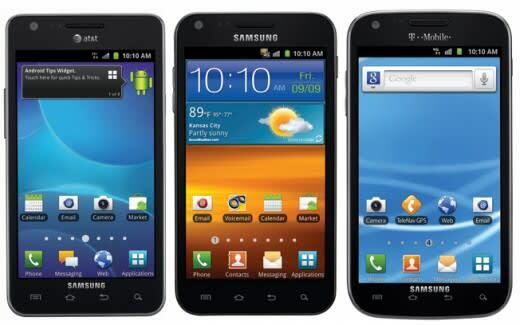 - AT&T&apos;s Galaxy phone has a slightly smaller screen than the others at 4.3 inches compared with 4.5 inches. It&apos;s also the thinnest of the bunch (and, according to AT&T, the thinnest 4G phone ever) coming in at just under 9 millimeters. - Sprint&apos;s Epic Touch 4G has a built-in true WiMAX radio and a textured back. It will be the first to hit stores on September 16. - T-Mobile&apos;s "Samsung Galaxy S II on T-Mobile" features the most distinctive design of the bunch, with smooth, rounded edges. It&apos;s packing the same 4.5 inch screen as Sprint&apos;s version. Android enthusiasts, say hello the A-team.